Saying grace before meals is a long held tradition that’s practiced by most Christians and Catholics alike. Throughout the bible, there are many examples of grace and blessing being performed before meals, (Matthew: 14:19, 15:36) (Luke: 22:19, 24:30). Yet, there remains no one set prayer that must be recited. Each grace can be either a personal prayer you’ve made for yourself and your family, or one of many traditional prayers that we have listed below. We can quietly contemplate our own grace individually, speak in unison, of have one of those in attendance speak for us. Like wise hands may be held or clasped together in font of you as you pray, the choice is yours, so long as you whole heartily mean the thanks to which you are giving the Lord. Unfortunately, like so many other traditions, many of us have been doing them for tradition sake, with little to no understanding of the importance of why we do them in the first place. In saying grace before each meal we are offering our thanks to the Lord for not only the meal before us, but for allowing us to enjoy the smells, tastes and textures that come with such a great feast. By giving thanks, we are praising God from whom all blessings are given, as food to eat is truly a merciful blessing. Even for those of us who are lucky enough to live in a country where food is in such an abundance that most of it goes to waste, we are still blessed to have such a large variety of flavors and cuisine for us to enjoy. For those of us who live without knowing when or where the next meal is coming from, we are blessed to receive the nourishment that sustains us, so that we may one day pull ourselves up and stand tall for enduring such hardships. 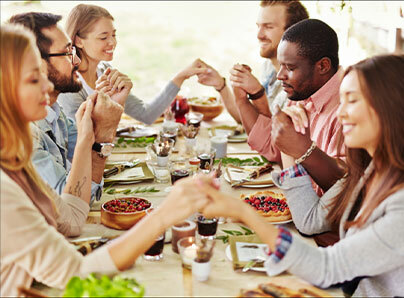 On more earthly terms, saying grace before meals helps to build unity, camaraderie and lasting bonds of friendship. Whether you are saying grace with your friends and family at a small gathering or daily meal, or with the community at large when gathering at a local feast or festival, sharing grace with out loved ones units us all, through our acknowledgment of our dependency on the divine mercy of God. That we may live with Christ on high. And all who shares with us today. For wind and rain and sun above. We thank Thee for our daily food. We thank Thee for Thy love and care. Be with us Lord, and hear our prayer. Thank you for your presence with us. Father, thank you for nourishment. For the warmth of the sun and the refreshment of water. For the miracle of the seed and the reaping of harvest. For the wonder of taste and the blessing of food with loved ones.